For the next several months, AZURE will publish serial installments of Aurelia: A Ballet in Prose, a contemporaneously unfolding novel by Sakina B. Fakhri. The Middle Ages, darkened of the classical flowering of ancient Rome and dulled in juxtaposition to the resurgent humanism of the impending Renaissance, witnessed a billowing of another fervor - the Western world at once experiences a staunch inhale of breath that ripples the entire Earth. It spews upon it cathedrals of solid constitution that stretch to the stars, bedecked with ribbed stone vaults and clustered columns; pointed spires burst through the horizontal foundations of the European countryside and give the impression of a vast Earth pointing with its metal fingers to the firmament; this age of so-called darkness in fact is witness to some of the grandest displays of unified artistic force to be visited upon this world. Walk through the narrow cobbled streets now as you did then, and see that they have created an infrastructure immoveable, and beautiful. And then there was the other aspect: The threads of antiquity collected in a central fist and spread outward in their synthesized equivalent, there was a thing - that, called faith - that, in its suppression, lent the animating force of magic to the sorts of practices and ideas that flower only in darkness; to the things that must take root in the private eye, unmolested, before they take to the streets in raucous display. So as the horses grazed upon the overgrown weeds of the Coliseum, lain fallow of artistic activity and communal sport by decree of the Church, and as the plague swept Europe, unifying its populace against a common ailment, the suffering was meanwhile personal to each person, and was a contained thing that could not contend in the mind against a sweeping expanse of disease to be referred to as a phenomenon by the annals of history… as this death was spread with rapid contagion, there were also traces of another unstoppable force: The dance that seethed in its way, cooked under the auspices of and simultaneously threatening the liturgical regimes that suborned it. It, too, had a name by which it would be remembered: danseomania. Danseomania, thought to be either a result of magic or an embodiment of the ills of society, boasted its adherents; peasants danced til collapse in the streets; young people gathered in graveyards and, feigning death, took turns kissing the deceased party back to life; and, on the floors of the basilica of St. Mark’s in Venice, labyrinths of colored stone were planted among the marble - priests danced along patterns that marked the path of the sun where it circles the earth. At last, the soil breaks - upon this slate cleared by the Crusades, the troubadours - makeshift soldiers released from duty - now return to their homelands and find that the courts have gotten along quite well without them. They take to their nomadic existence and summon a new value to their art. There is one city upon the face of Europe that is almost universally designated the bastion of the humanistic proliferation, and it is claimed that it was here that the fertile flowering that we have come to call the Renaissance found its most vehement outpouring. We find ourselves, at the present stage of our story, at the Palazzio Medici at the height of the Florentine Renaissance. The sumptuary laws of the time extended from dress to architecture, and thereby both women’s shoes and the palace facades were allowed allusions to the grandeur of classical architecture without the liberty afforded to them to reproduce these flourishes in fact. The Medici ruled Florence from within a block-like structure upon the landscape of Florence, notable as an edifice mostly in that it suggested a separation between spaces: Inside, the courtyard boasted a plethora of intricate carvings of classical provenance, sculpture-work and columns worthy of self-conscious royalty; outside, the unassuming facade stood calm sentry to the constant noise of horses hooves and hoots and wails of the urban thoroughfare that marched along its way through the streets. A crenellated brick & stone wall, 6 feet thick and 40 feet high, encircles Florence. The city is protected by a moat and 73 machicolated waters. There are two tall towers with bells--one is the call to prayer, and the other is a summons to assemble in times of crisis. Both were called to duty upon a bloody night in 1477, where the details of a family matter will be expostulated for our perusal. Amidst the Christian revivalist sermons of Savonarola and the staunch philosophy of humanism propounded by Pico della Mirandola, the rule of the city of Florence - as befitting its mercantilistic roots - fell to the alternating favor of two of the largest banking families of Italy: The Pazzi and the Medici. Their fluctuating and oft-exchanged loyalties to the Papacy signified only the currency of their battle - which, if we are to come to the heart of it, was a battle of accounts, of precision and posturing. And why should it not be so! The masques of the ancients - Apollo brought to life, the actor seething in all manner of expression beneath the stoic exterior crafted for him by the artisans his countrymen, paraded before the populace in a show, a demonstration of *what could be accomplished*. The changing of an era takes upon many masks in many places - the change that percolates beneath a posturing that stays constant until it ceases to fulfill its purpose. Such were the seemingly unchanging masques of antiquity; such is the show of a unified military force that belies a country in hidden turmoil. The year 1477 saw a bloody and only partially successful assassination attempt by the House of Pazzi upon the House of Medici; it is in fact the aftermath of this struggle, and the subsequent punishments enacted on both sides, that is the subject of our attention. The Medici had lost to the Pazzi their control of the papal finances upon the ascension of Pope Sixtus IV, and it was widely understood that this secular regime with its bedrock in divine patronage had reached a moment ripe for upheaval. Montesecco, who was to carry out the assassination, refused at the last minute to commit such a grisly act upon holy ground; in his stead, two priests accepted the assignment. On the 26th of April in the year 1478, at the moment the Most Holy Sacrament was raised, Guiliano (brother of Lorenzo) was publicly murdered in the Duomo of Florence; Lorenzo himself escaped with a non-fatal wound to the shoulder, into which he believed had crawled the dolphins off the Coat of Arms of the House of Pazzi. Even after Lorenzo’s injury had healed over, he believed a phantom of these dolphins to linger whenever he felt the sting of the old wound, and in this way, concern of the Pazzi entered into the ruling arm of Florence and shadowed Lorenzo’s brow even in the midst of his success. Francesco de Pazzi was hung from the windows of the Palazzo del Signoria. His five co-conspirators were executed in less ceremonious fashion. The head of Jacopo de Pazzi travelled posthumously to more varied locations than it had in life, and now reposes at the bottom of the Arno river. From this bloodshed was granted leniency one individual of the House of Pazzi: Guglielmo, husband of Bianca, who - after a marriage that had been tacitly smiled upon many years before - had stepped from her birthright as a blood relative of the Medici to an exalted position as an addition to the House of Pazzi. She had not set foot in the Palazzio Medici since her marriage. After the events of the aforementioned conspiracy and the subsequent exile of Guglielmo, the return of Bianca to her rightful house had been decreed by Lorenzo for immediate fulfillment. And so the Palazzio Medici sought to recall its richness with this recall of its wayward member. Giovanni, cousin of Lorenzo, was granted two rooms in the Royal Palace—one for his sleep and dress, and the other for philosophical contemplation. He was thought (and rightly so) to be the most scholarly of the Medicis, though it was also widely thought that this mathematical intellectualism could yield no practicable benefit to the Medici fortune. Giovanni sat in his small study by the light of his candle late in the night, weary with the nightly realization that he would have nobody to whom to report his epiphanies in the morning. His most victorious moments made plainest the loneliness of having to hold, in the moment before it is shared, a new thought for the very first time; of knowing oneself to be the only one ever to have held it. Under this weight (for he was quite brilliant), Giovanni would sleep until such an unseasonably late hour that he could be finally aroused only by the declaration that breakfast was nearly over. While breakfasting greedily on his meal, the other members of the household took their tea. Giovanni would then be beset by both the men and the women of the house, who took no pains to refrain from assuring him that he whiled away his hours in fruitless contemplation while his family lagged in military strength without his command and the house fell to disrepair. Giovanni’s bedroom was one among the row of domestic rooms accorded to the inhabitants of the court; his study, however, was located just beyond the edge of the fringe overlooking the courtyard. This courtyard could be reached by way of a passage roofed by a supremely vegetated trellis. The courtyard balcony, which extended all around the empty white marble space below, was this evening lit like a stage in the moonlight. That night, Giovanni found occasion to pause in his thinking on matters of Pythagoras. A strident melody drew Giovanni to traverse the trellis until he stood on the second-floor balcony overlooking the courtyard stage. Giovanni spied a young woman sitting upon the corner edge of the marble step, a violin rested on her shoulder, her eyes blithely half-open to the scene. The city outside was silent; even the latest risers had gone to sleep long ago. The notes of her instrument were clear and travelled crisply in the early winter air, dampened by none of the heat of the summer. Giovanni deposited himself carefully behind the southernmost Roman column, lest she perceive his intrusion and regard his figure before he had ceased in regarding hers. So Bianca had returned at last! Her hair fell upon her shoulders in dark yellow tresses, as he had remembered. She looked younger to him, lighter, in that she was now unattached and less of the weight of the future (for the future was now unarguably less) that had so characterized their interactions in childhood seemed to weigh upon her. There was this lightness to her features, the lightness that occurs in the relief of tragedy, and yet there was the feeling that she had become quite alone in a way that neither the Medici nor the Pazzi would be able to understand. Her melody became a rope demarcating the area surrounding her person, proclaiming that her narrative was singly wrought and could not be fully claimed by either House. The flowers that bedecked the courtyard, each in their variety of colors and shapes, seemed to play each a note as she pulled the notes through her violin; the whole garden conspired with the motions of this instrument. The sonorous color multiplied in lustrous variegation. The flowers rustled in more than uniform percussion but each seemed to hold within itself a specific note and a specific tune, released in a harmonious concordance. Giovanni, despite himself, moved towards the woman until he stood upon the balcony nearly above her; he felt the vibrations of the violin in his feet though now he could no longer see her. 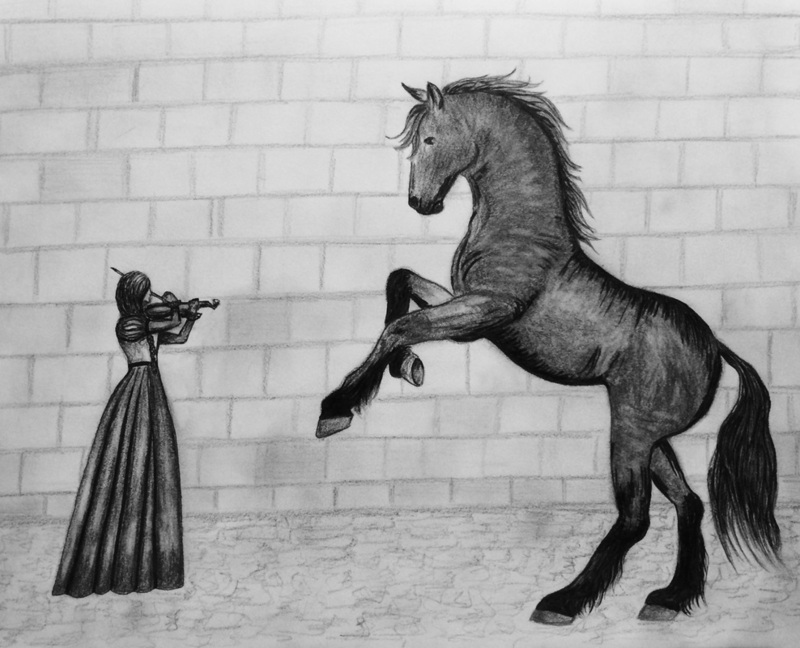 He saw now, from this angle, that a horse had become trapped in the courtyard after the nightman’s watch, and, perhaps thinking that this was the sort of performance to be had in the courtyard every night after its expulsion, this horse was attracted unwittingly to Bianca’s notes. The strokes of the bow emitted first a high-pitched wail, then an earthy, throaty quality; the horse reared up on its hind legs and rolled his first two hooves to the melody, all of the veins moving in a crisscrossed pattern among themselves with each movement, like branches of their own accord. Giovanni turned the corner so that he could see into her face, and she his. “Bianca!” he shrieked. He had not expected his voice to fall so discordantly upon the marble stage. It sounded guttural, boyish in its ill-concealed excitement. The horse, alarmed, galloped into the shadow of the portico. Giovanni first saw a polite smile, then, as he held Bianca’s gaze, a look of abject fear at being found out. Perceiving that she made as if to run, Giovanni ran the perimeter of the courtyard balcony and quickly found himself on the marble step. Bianca had gone to her room; the horse abashedly witnessed his master’s failure. Breakfast differs from dinner in that there is not yet, at that early hour, a readiness for the social spectacle of cohesive conversation that can animate all tete-a-tetes at a table into a unified discourse. At this period of early morning in the main banquet hall of the Palazzio Medici, most conversations were carried out in ones and twos amidst the clinking of forks and glasses, and a sense of privacy within this public space was granted to these pairs of conversants; their banter was scattered throughout the room. It is fair to say that each of them ceased when Giovanni, arrayed more finely than he was wont most mornings and with a particular flush in his cheeks, entered the room. The doorway framed his figure so that it appeared for a second that the space had become a wall, and he the subject of a Botticellian fresco that struggled to find its moorings in the frame. Giovanni broke the stillness of this painting in some moments, tacitly returning the group to their conversations, and took his seat next to Bianca. She strove to avoid his gaze (though she was also consciously disengaged in conversation with anyone else, and one was met with the vague but unsubstantiated presentiment that all other conversations were ABOUT her and her intrusion, regrettably, was therefore precisely unwelcome). She sliced her bread with great precision of focus and felt compelled to send her eyes towards the ceiling as she took long swills from her cup. When at last her gaze alighted, Giovanni leaned to her. “I know you must think I am angry with you; I need to assure you that this is not the case,” he said with great earnestness. She looked at him in surprise. “I’m not angry!” she exclaimed. They exchanged a solemn nod, and then Giovanni spoke, to diminish the tension, “Besides, if the young girl who used to scheme to escape her lessons on the harpsichord can play as beautifully as you have last night, I know you will be valuable to Lorenzo. More than even I, to say the least. With my… mathematics.” He laughed in self-deprecation. “Why do you do that?” Bianca asked. Giovanni pointed conspiratorially, with his fork, at the Count and the Duchess sitting across, cutting their bread with silver knives. “And what exactly might that be?” Lorenzo inquired, his attention arrested. The group, stunned at this declaration, nodded questioningly at Giovanni as if to say, “You?” Giovanni nodded in assent and shrugged good-naturedly at Bianca’s speaking out so brazenly on the morning of her arrival. Lorenzo smiled, in spite of himself, and we will assure you that this sort of ballet was indeed utilized by Lorenzo’s regime and did provide one of the most artful shows of force that, today, is practiced in controlled competitions and world olympics with a single horse and a single trainer in every performance; to the attuned historic eye, however, even these modern caprices hearken back to a time when these equine movements were performed by a cavalry of horses that numbered in the hundreds, by ready armies in times of peace. Dinner banquets at the Palazzio Medici were elaborate public affairs; the jewels of the house were displayed upon the ladies of the house and precious gems and artifacts attesting to the Medici fortune were paraded in front of the guests. It was in preparation for such an event that a carnelian engraving that had once been saved (but never given) for Bianca’s wedding; Giovanni stole into the treasury one night and procured this for Bianca, presenting it to her in secret. He did not understand why, afterwards, she had failed to meet his eyes. She seemed, in fact, to avoid his presence as much as was possible. This aside, Bianca was slowly re-integrated into daily life at the Medici household, and so the ladies were more than surprised to find her sitting solemnly against a pillar, gazing at the stars, while the guests were preparing in the banquet hall to be served their first course. “The dancers are ready to begin,” she was told. “You must come inside.” Dinner was to be served alongside dramatic entertainment, the narratives of the tales intercut by intermedii - movements of narrative-less dance during which the different courses of dinner were brought to the tables. The lavishness of the affair extended to the level of the confections, which were formed into sugar figurines that represented the characters of the play. The gliding notes of Bianca’s violin followed the inflections and the rhythms of speech imitated by the festooned dancers. She slipped into their movements, feeling one character, and then another, tied to the string of her instrument as though their feigned sorrows and jests puppeted the various strings of a larger lyre, a pool of universally unconscious vibrations of human experience from which every player of every instrument dips into and swims, finding eventually a wave congruent to the emotional tenor of their situation - and with every note opens up, as a line unto a plane, a whole breadth of human experience of the time and place at which it was first translated into musical expression. And then, a curious thing happened - as Bianca glided onwards she noticed a most intriguing phenomenon. No longer were the dancers pirouetting and arabesquing of their own accord, but they seemed to fall into the melodies she created for them - the jester understanding that the basic rhythm corresponded to him, the aristocrat feeling in his sinews that it was the trebling harmony that was contracted for him to follow. The polyphony of the religious melodies of the Middle Ages fell away, and for each human was a melody particular. With this one instrument of its six strings, dictated by the mathematical calculations of Pythagoras, Bianca pulled different strains of the pool at once, and did not record this time and this place and this dance, here in the court of Lorenzo de Medici in the year 1477, but instead brought those times to this one, and a grand classicality was played out here in the movements of Il Capitano and Pantalone. The clattering of forks and the plates became part of the movement as the third course was served, a solemn quiet having come over the banquet-goers at this intermedio which was provided to them in fact for a time to mingle and release in between the dramatic acts played out during the formal courses, but instead they sat in rapt attention and watched young Bianca - who should not have been there at all - the folds of her pink dress carving out the lines of her overlapping melodies as she swayed with the movements of the violin, her eyes now closed and appearing darkened hollows, as her tune choreographed the dance splayed out before them, moment by moment, and so the dancers fell into this pool of time and of human experience, and in enacting this choreography felt themselves connected to movements that seemed to have been passed down from an ancient time, that followed the geometries set out by Euclid and Archimedes several thousand years before, that invoked the magic promised by Apollonius and the faith embalmed by the rule of the Church for the past thousand years. And if one could see beyond their masks, one would have seen! One would have seen how this affected them, their knowing instinctively that they participated in something that probed the depths of the senses. For simple moves do not a dancer make. It is that there is something inexpressible, amorphous, that seeks desperately to be animated and that is then made physical through the concatenation of bodies willingly relenting to a unified whole that extends out in concentric circles from a banquet to a nation, a nation to a contininent and a continent to a universe. And what, then, of all this pomp and circumstance over the mere living and dying of bodies, when they are able to participate momentarily in this animation of the universe, one thinks that perhaps they are retained after all - that the essence is preserved and the cycle of mortality is mere a cycle of costumery subject to the demands of the changing of the stage. Giovanni looked up from his dinner, catching Bianca’s eye. She saw a flicker of recognition in his eyes. As the applause burgeoned around her, she lifted her skirt and strode out of the hall into the courtyard. Aurelia relented - she, who was not at all, nor ever had been, the Medici’s beloved Bianca. Our entire magnification of these proceedings has occurred within the Palazzio walls, in and around the courtyard, its stage, differently arrayed for each engagement; think of a square that is deserted for years before a revolution overtakes its streets, and if you think of this, then the phantoms of the future may enter upon the empty stage of memories long past, populating them with a palimpsest of men and women and structures and horses that never did interact in time but are inseparable in space - and what if one traveled entirely in space instead of through time, encountering in each physical place a hodgepodge of its greatest historical figures and the masses of the populace living all together? If one made travels between the ends of the Earth instead of from the beginning of one’s lifetime to the end; would both be endless, both spheres? How differently would the character of each country appear! The actors in the Coliseum smudged with the paint of warriors, horses from the Middle Ages grazing at the toes of Savonarola as he yells of brimstone and fire during the heart of the Renaissance, denouncing the classical dramas that play out all around him… Tourists with guidebooks and cameras, navigating the space between the masks and the warriors, between Pythagoras and Erasmus. And what if we add to all of this the characters who have visited this space in the imagination of an artist, so that Apollo and Dionysus play their lyres in battle between them, a whole host of Roman figures of the flesh playing out their scenes to these conflicting melodies. And is it not indeed so? Do the dancers of the ballet not glide to the balanced melodies of Apollo, leap to the tune of Dionysus? Can they not hear it in their heartbeats and in their respiration? Can we say for certain the world is not this way? Because still we constantly contend with the constant balancing of the eternally shifting imbalance of Apollo and Dionysus, of reason and instinct. Think not yourself safe, alone in your home by the light of your candle, dear reader, for a plethora of figures dance in circles around you to their deaths, and, softly, you may hear their music. Do not lament that the figures just related have long been dead, for they exist each in their own way, to infinitude.